Recruitment to the post of Multi Tasking (Non-Technical) Staff in Different States and Union Territories, 2016 – Releasing results of withheld candidates of Staff Selection Commission (Western Region). The Staff Selection Commission had uploaded the final result of the recruitment to the post of Multi Tasking (Non-Technical) Staff Examination 2016 on 28-4-2018. 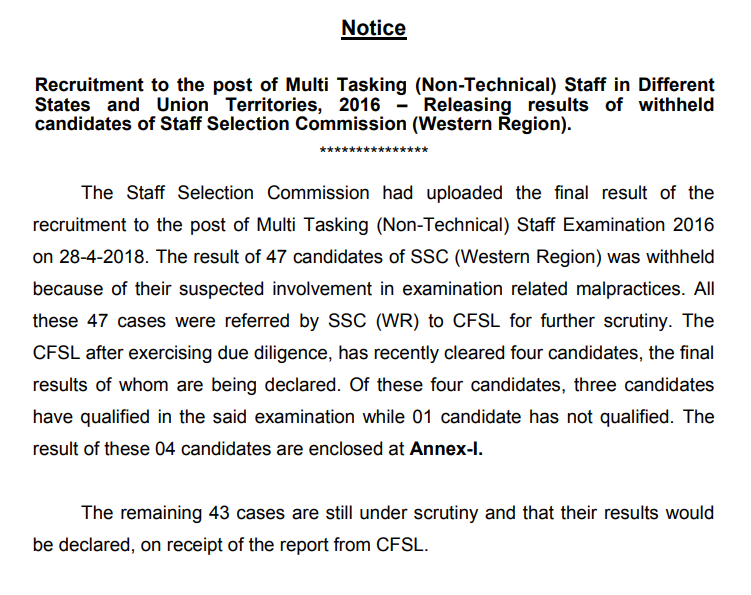 The result of 47 candidates of SSC (Western Region) was withheld because of their suspected involvement in examination related malpractices. All these 47 cases were referred by SSC (WR) to CFSL for further scrutiny. The CFSL after exercising due diligence, has recently cleared four candidates, the final results of whom are being declared. Of these four candidates, three candidates have qualified in the said examination while 01 candidate has not qualified. The result of these 04 candidates are enclosed at Annex-I. The remaining 43 cases are still under scrutiny and that their results would be declared, on receipt of the report from CFSL.